These are the words of Deaconess Mary Andrews. You might recognise the name! 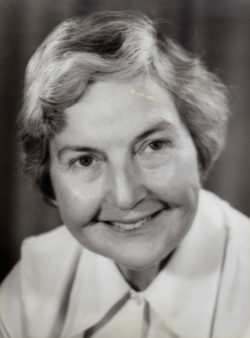 Mary Andrews was the longest serving principal of Deaconess House: from 1952 – 1975. Earlier in her life Mary had been a missionary in China. Her book Going it alone is about her ministry in China and is an amazing read. After Mary died, Deaconess House was renamed Mary Andrews College. I had the privilege of meeting Mary on a number of occasions and in fact visited her just before she died in 1996. This was a few weeks after the 50th anniversary of her becoming a Deaconess. Her life was a testimony to the truth of the words that she wrote. The measure of what you can do for the world will be simply what you let God do with yourself. Do you ever long for your life to be significant and meaningful? Do you ever wish that God would use for His purposes the ordinary involvement you have in life each day? Do you ever pause in the midst of a new awareness of the pain and dysfunction of this world and long that God would use you to make a difference? This last week we were confronted yet again with evil and the indescribable suffering following the appalling tragedy in Christchurch. Interestingly we are also witnessing the exceptional leadership qualities of Jacinda Ardern, the New Zealand Prime Minister. Jacinda, who I understand is an agnostic, has displayed the power of compassion, humility and great wisdom. I have been most impressed and grateful that such sensitivity is being shown. As I reflect on the suffering throughout our world, at all different levels, I’m aware of something that is unique for Christians. We, in our everyday lives can point people to Jesus, the source of all compassion, humility and wisdom. Mary Andrews College, as many of you would know, is a ministry of Anglican Deaconess Ministries. ADM is about seeing Christian women from generation to generation flourish in Kingdom work. God is in the business of building His Kingdom. Women from all generations have a vital part to play in what God is doing. It is breath-taking and sometimes initially scary to be part of this eternal plan that God is unfolding. Mary Andrews became a Christian when she was 10 years old. She wept at the injustice of Jesus’ death. She also wept realising that she, along with every other human being, was responsible for His death. Yet the joy of forgiveness and love for her Saviour led her to serve Him in numerous ways throughout her life. For Mary, that included becoming a psychiatric nurse, a Bible student, a deaconess working amongst the poor and needy, and a missionary in China. During World War II, Mary needed to escape China and fled to India. There she continued her ministry of care for the disadvantaged working at a children’s home and a home for destitute women and girls. When Mary returned to Australia she was appointed as the head deaconess in Sydney Diocese and then as the principal of Deaconess House. In her retirement she continued visiting and caring and encouraging many people. Mary was always a passionate advocate for women. She longed that they would see that God had gifted them to be His ambassadors in whatever they did throughout their life. Mary modelled something even more significant. For her, it wasn’t what she did for the Lord that was her focus. It really was about letting God work in her. That is why prayer was so vitally important to Mary. For God to use her as she served Him was a privilege. Her challenge to us now is ‘are we prepared to be shaped by His hands. To rely on Him for our every need’? Her life, her ministry and particularly her relationship with God challenges each one of us who benefit from her legacy. Jesus was beginning his public ministry. Luke tells us that Jesus had spent six weeks in the desert as Satan tempted him. But Satan failed at tempting Jesus into using His power inappropriately to meet his own physical needs. Satan failed at deceiving Jesus into worshipping him in exchange for worldly glory. Satan had failed in tempting him to prove himself. In other words, Satan had failed in distracting Jesus from his purpose. And Jesus never used his power inappropriately or to put people down. Jesus saw through the false enticement of worldly glory. Jesus’ identity was never grounded in ‘proving himself’. Yet Jesus must have been affected greatly by those six weeks in the desert. He returned to the area of Galilee. We are told he returned in the power of the Spirit. He went back to Nazareth, the little town where he grew up and walked into the synagogue, as he would have done so many times over the previous 30 years. Jesus stood up to read and was given the scroll of the prophet Isaiah. We have this document ourselves in our Old Testament. Jesus finds the part in it that he wants to read. Remember Luke has just told us that Jesus had returned from the desert in the power of the Spirit. Luke also has told us at the beginning of the chapter that Jesus had been led into the desert by the Spirit of God. Then Jesus read what Isaiah had written 600 years earlier: “The Spirit of the Lord is upon me.” Isaiah was speaking of one who was to come. These are the things that people have longed for throughout history – including in our own era. The people in the synagogue that day would have been familiar with this passage. They would have seen this passage as the great hope of freedom for them. Freedom from the suffering they were enduring under Roman rule. For surely the Messiah who was spoken of so often in the Old Testament must come soon. The image they had built up of this messiah was one of a conquering hero, one who would solve all their worldly problems. Here stands before them a man from their own town. A carpenter’s son. Yes, an amazing man who had started to perform miracles. A man who spoke gracious words. A man they knew – or did they? When Jesus finished the reading and handed the scroll back to the attendant, he sat down. This doesn’t mean he went back to his seat in the congregation. No, he sat down as the teacher and all eyes are upon him. I would imagine you could have heard a pin drop. Jesus was saying that the Messiah had come and that He was the Messiah. He was the man! He was the one who would accomplish all the freedom that they so desperately needed. Jesus spent the next three years demonstrating that He was no ordinary man. That He was and is the God/man who indeed has the power to bring freedom. He was also the great teacher who steadily helped people to understand the fundamental need for freedom: The need for freedom from the consequences of a broken relationship with God, the need of every single human being. The issue that has been at the centre of all the suffering in the world. It wasn’t just dealing with external things or people who enslaved and harmed. It was within the very person who was crying out for relief. To have compassion, humility and wisdom does not in itself enable the sort of change that is needed in people’s hearts. Jesus knew that only His death and resurrection could do that. He also knew that when men and women had their hearts changed because of what His death enabled; then as they lived for Him, they would be His instruments to change the world. Yes, they would be the people who were now enabled to love; to speak up against injustice; to model a new way of living; to have access through prayer to the power of the living God; to have God’s very Spirit live in them; to endure hardship and suffering knowing that God would fulfil His promises to bring about a new heaven and earth; and most importantly of all be able to introduce others to Him. Those who are graduating tonight and are receiving pastoral care awards have spent time learning from Jesus through His word here at Mary Andrews College. Some of you have been doing that for many years. I want to say to you how delighted the faculty and staff are to have been able to journey with you in this season of your lives. We have witnessed your delight in growing in your faith, we have shared with you in the joys and sorrows of assignments – yes, God can use even those wretched assignments to build our Christlike character. We have prayed with you and for you through some of the difficult times you have faced in your lives while you have been studying with us. We have seen you grow and mature. We have heard of your vision for Christian ministry. We have heard sometimes of the frustrations you have experienced in seeking to serve God and not being encouraged to do so. We have seen some of you try things that you never felt you could do, and you did it. We have seen the community that you have built with fellow students. A community of support and encouragement that we hope will continue on from here. You know the deep inner work that God has been doing in your lives. This time of study has not ultimately been about passing assignments. You may have completed your diploma or certificate, but God’s work isn’t finished. God’s purpose for you isn’t finished. It is my prayer that you will see the whole of your life as an opportunity to live for Jesus. To find your satisfaction in Him. To have great expectations of what He will do as you stay deeply connected to Him and His people. To flourish in Kingdom work in whatever opportunities God leads you to. There is no other name though whom grace abounds.